Can we come for wine tasting? Since we are not a Winery, we don’t have a tasting room. We offer an amazing selection of wines that we purchase from our beverage distributors. (reds and whites, dry and sweet, and EVERYTHING in between!) Yes, you may purchase by the glass, or by the bottle so you can sit out on our beautiful patio and sip with your friends! When you book a wedding with us we are open for you from 10:00 am until 11:00 pm. We suggest you hold your ceremony at 3:00 pm to allow plenty of time for photos before your reception, dinner, and dance. Because of local zoning, beverage service must end at 10:00 pm, and music must end at 10:30 pm. (no exceptions.) Also, we are located in a residential area and are committed to being a good neighbor. We have ADA Compliant Restrooms in BOTH The Loft, and the Grapevine Pavilion. Carmella's caters for groups of up to 50 guests. service for up to 200 guests. The Grapevine Pavilion is equipped with a “caterers prep room” available for our licensed caterers. It has plenty of counter space, a hand wash sink, hot water, a large sink, and a commercial refrigerator. 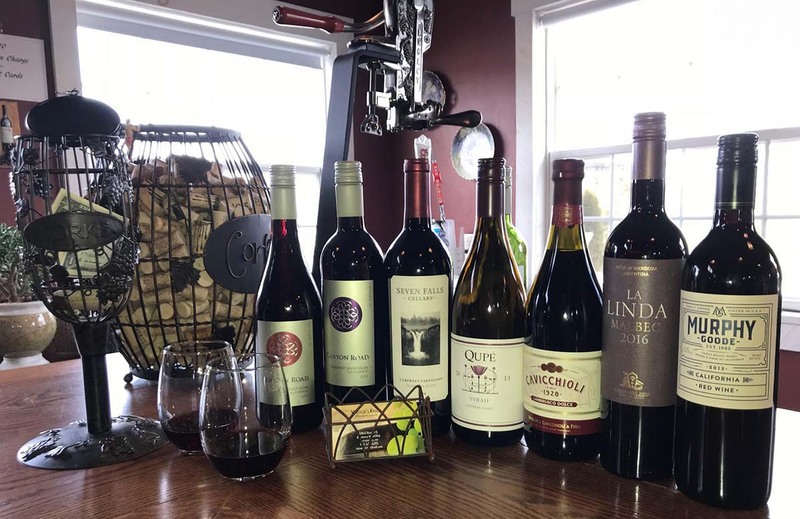 We are properly licensed with the State of Wisconsin and hold a “Class B Liquor License.” That means we can provide all of your beverage needs (wine, beer, mixed drinks, and soft drinks.) You are able to either “host” the beverages so your guests do not have to pay for their drinks, OR we offer a combination of both so you can pay for beer and soft drinks, then guests can buy their own mixers and wine. A reminder, the beverages are not included in the cost of renting our venue. There is no additional charge for our licensed bartenders. We collect a beverage deposit (separate from your venue rental) one month before your wedding. At the end of your event, we either refund you if you have overpaid, OR we collect the balance due from you. (Please note: No minors are allowed in the barn without a parent or legal guardian.) Carry in beverages of all types are NOT ALLOWED. All guests must drink responsibly. Overnight parking is FREE! We encourage overnight parking and you can pick up your car anytime! The Loft has heat and air conditioning. Our Grapevine Pavilion has custom canvas curtains with vinyl windows. In case of inclement weather the curtains can be rolled down. We have attractive gas heaters that can warm up the pavilion during cool evenings. Restrooms in our Grapevine Pavilion have heat! Children are welcome at your Whistler’s Knoll Wedding, however they must be supervised at all times. Please do not allow them in our flower gardens and landscaped areas because of damage it causes to the plants. Also please note that anyone entering our barn must be 21 years of age or accompanied by a parent or legal guardian because of State Liquor Laws. In the Loft, we offer WiFi, projector, screen, and high quality speakers which are available at no additional charge. Our SONOS smart system offers a superb experience for you and your guests both inside the Loft and in Holly’s Wine Garden. We have plenty of parking space for 200 vehicles including four handicap stalls. Please do not park in handicap spaces if you do not have a permit. We encourage guests to leave cars overnight. Pick them up ANYTIME as long as they are gone by next month! We love to see cars in our parking lot when we arrive the next morning! Ask us about convenient shuttle services. You can hire them at a reasonable cost to transport your guests from local hotels! Please schedule a time during the day of your event to decorate. (Or rent the night before and hold your rehearsal, complete your decorating, and have your rehearsal dinner at Whistler’s Knoll!) All decorations and personal items should be removed at the end of your wedding day. Candles are not allowed inside the barn but are okay in the Grapevine Pavilion. Please don’t use confetti, glitter, rice, birdseed, or any other difficult to remove items. No synthetic flower petals because our chickens eat them and get sick. Yes, you sure can use real rose petals! In the Grapevine Pavilion, we recently doubled the amount of festoon lighting. Because of that, decorating is NOT allowed on the ceiling because it causes damage. Our staff will take care of general clean up at the end of your event which includes sweeping of floors and garbage removal. Service animals are permitted with advanced permission. You will be charged for damage caused to the gardens or property by either children or adults. Guests should be respectful of our property and gardens which includes all mulched areas. Smoking (including “vaping”) is prohibited on the property with the exception of a smoking area. If cigarette butts are strewn throughout the property and gardens, there will be a $100 clean up fee. Whistler’s Knoll is committed to supporting our community and the neighborhood we live in. Our goal is to fulfill as many requests as we possibly can. Because of the high number of inquiries, we regret that we are unable to fulfill all requests and sincerely hope you understand that. Anyone seeking a donation must complete a donation request form. We require a 30 day notice prior to your event to allow adequate processing time. Allow 7-10 business days for request approval. IF approved, we will email a confirmation to you. Please understand that completion of this request does not guarantee a donation. You can download our donations request form here.